I love, love, LOVE books that have necromancers as the main character. They are SO interesting! 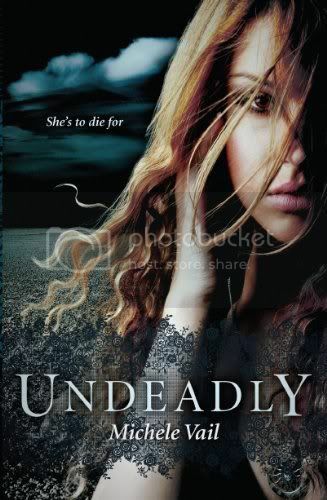 That, and the fact that Harlequin Teen has some pretty awesome books, has me really excited to get my hands on Undeadly. I haven't read a good YA necromancer novel since Kelley Armstrong's Darkest Powers triology! So excited for this release. Yep, Harlequin has phenomenal titles and this one sounds awesome! I'm just sad they pushed the release back and back... I hope it stays at the end of the year! I am seeing this one around a lot! The cover is mighty intriguing too! I hadn't even seen or heard of this one before. I tend to enjoy Harlequin Teen books so I am sure this will be just as good. The synopsis sounds intriguing. Thanks for bringing it to my attention. I haven't heard of this one! I don't think I knew what necromacers were before YA and Undeadly sounds interesting. I agree about Harlequin having awesome books, hopefully this one is the same! I've not read a necromancer book, as they've never seemed like my type of "thing", but this DOES sound really good. I will be adding it to my GR for sure :-) Great pick! This sounds like a super awesome book! I first heard about it a day or two ago and it's already on my "stalking unreleased books" list! :D Excellent choice! Oh my god!! Necromancers, you say? My last necromancer related read was ages ago: Hold Me Closer, Necromancer from Henry Holt and it was very satisfying. This sounds so good! Adding it to my list! Great pick! I am LOVING the sound of this one Christy! I'm a huge fan of antagonistic relationships, and clearly we're going to have that with Rath. Complete win:) Why must November be so far away? I've seen this one moving around quite a bit, and I'm really curious about it, too. :) Thanks for sharing, Christy, and I hope you get to read it soon! Sounds like she's in quite a sticky situation!! Yes, this sounds awesome! With a school full of necromancers I'm wondering how they train lol. I'm sure it'll be very interesting! I don't think I've ever read a book about a necromancer, but I so want to read this! I have the same book included in my post, and a few others. Great pick! I'm really excited to pick this one up.